There are two things Kalamazoo can never have too much of. BBQ and food trucks. 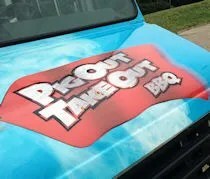 Pig Out Take Out BBQ has set up shop in the parking lot of the old K-Mart on the corner of Drake Road and Stadium drive in Kalamazoo just north off the Kalsee Credit Union. As you drive on Drake, the truck is hard to miss. It’s a brightly colored van that stands out in the abandoned parking lot where K-Mart used to be. The menu is pretty small focusing on sandwiches and sides. There was a couple in front of us when we got there, but we really didn’t need the time to look over the menu. We both zeroed in on something right away. J stuck to our usual and ordered the Pulled Pork Sandwich and a side of Baked Beans. The slow smoked pork was very tender and very smokey. There wasn’t a whole lot of sauce on the meat, but that didn’t bother J this time. She said the meat was so good and so tender on it’s own, it didn’t really need a lot of sauce…and J almost never says that. The home made baked beans were an addition to the meal. Everything is a la carte, but the sides are all $1.50. 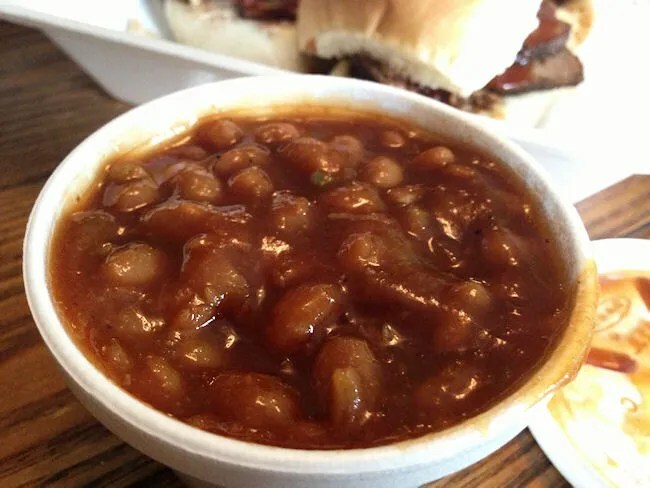 The large portion of beans were swimming in BBQ sauce and a delicious side to the pulled pork. I’m glad I decided to meet J there instead of just letting her pick up lunch. 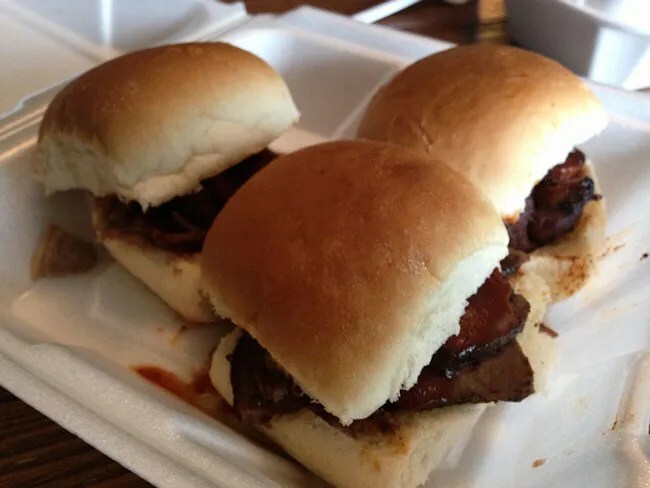 I would have loved the pulled pork, but I chose the Slider Trio instead. 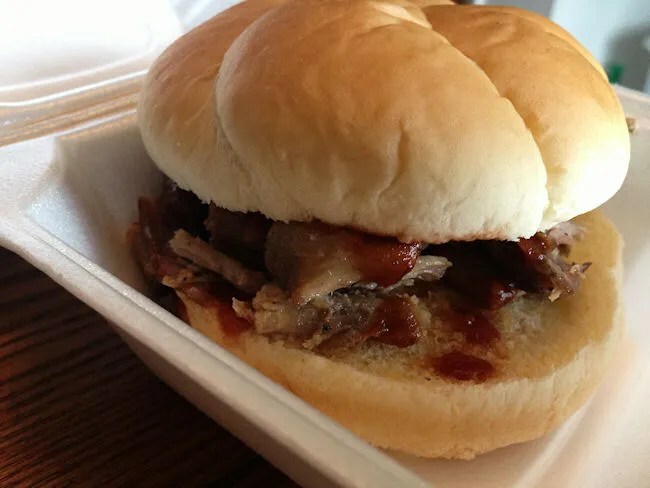 The trio consists of one slider each of pulled pork, BBQ chicken, and brisket. All three were super tender with a smokey goodness. I’m always iffy with brisket, but this stuff was tender. One thing J pointed out was the bread. It was so soft and fluffy. According to the Gazette article, they get their breads from Renzema’s Bakery in Parchment. Bread is usually an afterthought, but the bread on these sandwiches really made the sandwich something extra special. The bill for two sandwiches and side came in at just under $14. 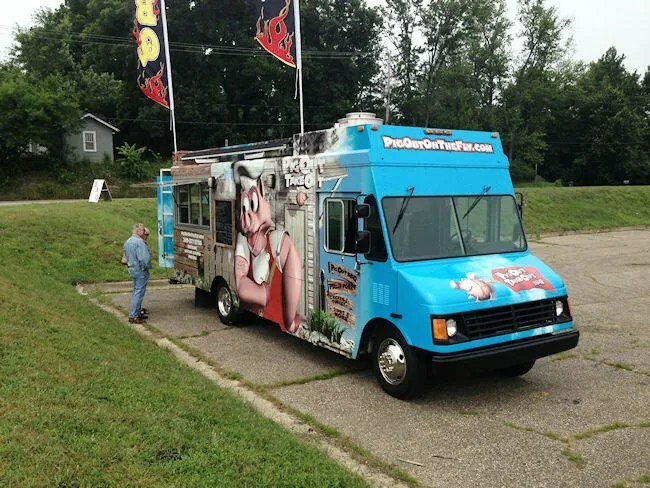 Pig Out Take Out is another great food truck and another great BBQ joint joining the Kalamazoo culinary scene. J really liked the ‘que and I thought it was quite delicious myself. 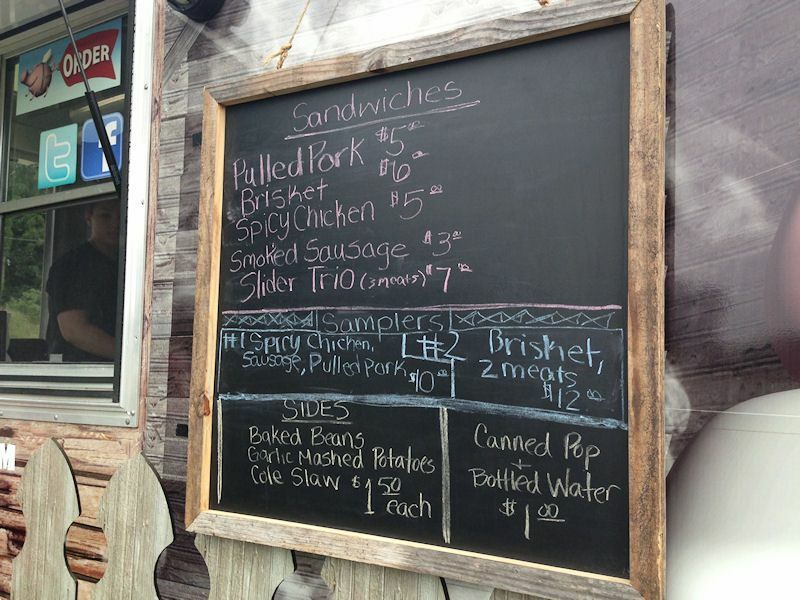 Very happy to have a quality BBQ truck so close to home. Delicious. They’ve been at the downtown Lunchtime Live events and I’ve had them twice already. The fries are fresh cut as well I believe and $3. Great ribs and sauce. They will be going places really soon.